Dim the lights, turn up the ragtime music , and get out on the dance floor as you kick off the Jazz event of the year! 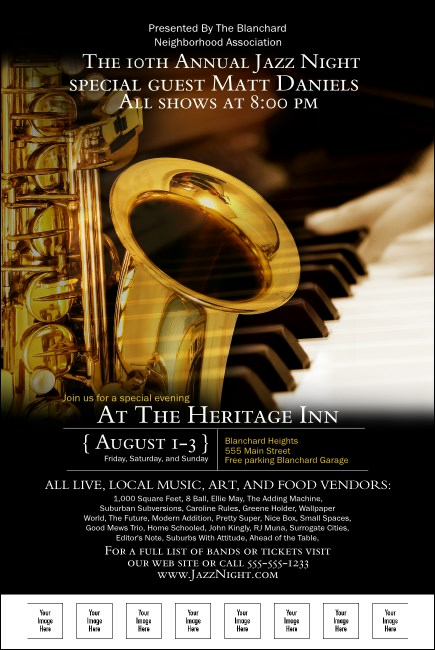 Fully customizable Jazz Posters advertising your event feature a saxophone, keyboard, and that soulful sound . As the lights get low and the rhythm starts, your sales will soar! Make your next event top the charts with a Jazz Event Kit from TicketPrinting.com!